*loose skin tight and regenerated. Ideal for eyelids and lip lines. Plasma skin tightening is a new technology to treat saggy skin, deep lines and wrinkles what is getting more and more popular around the world. VISTA Clinic Australia offering the treatment for our cosmetic patients. Low energy plasma will be performed by doctor or dermal clinician at the Melbourne cosmetic clinic. High energy plasma wrinkles treatment will be done only by experienced cosmetic doctor, expert and fellow of ACAM in Melbourne clinic. What areas can be treated by plasma for skin tightening? *any fine wrinkles and loosed excessive skin. Is plasma skin tightening painful? sensitivity or allergy on anaesthetic products. Some of our Melbourne cosmetic clients prefer not to use numbing cream due to it’s irritative and skin drying features. If you can tolerate well the skin tightening procedure, our expert cosmetic doctor in Melbourne clinic will use alternative (less strong, but less side effects) pain relief. Fascinating concept of plasma itself and it’s use in cosmetic medicine. It is well known these days the matter has four states – solid, liquid, gas and plasma. Plasma is described as a “liquified gas” in which the electrons are stripped from atoms to form an ionised gas, in which ions are free to move. The device generates plasma, when it touches the skin surface, the heat widens and is subsequently transferred into the epidermis all the way to the papillary layer of derma which contains fibroblast cells. Tissues are treated “sublimate” and we avoid spreading unwanted heat to the surrounding areas. The surrounding healthy skin will be a source of regeneration. The result is contraction and tightening of the skin, as well as superficial resurfacing based on creating a controlled skin damage, which activates its healing, and this leads to the skin regeneration and improvement in the texture and quality. Melbourne cosmetic clinic patients often interested not just in what new innovative skin tightening devices in Melbourne are available, but also how it works. What should I expect after the skin tightening with plasma treatment? The results of skin lift and tightening of loose skin will appear immediately after the plasma treatment. Once completed dark brown spots will peel off and heal within 3 to 10 days of the treatment. You can use alcohol swabs to wipe the dark spots off. VISTA CLinic Australia friendly reception will supply you with post procedure care free of charge (please, ask, if need more). There is a possibility of mild swelling at the treated area on the day of treatment and following day. Makeup is advised to be avoided on the treated area 5 to 7 days after the eyelid wrinkles treatment. If you experience any concerns or questions, please, feel free to contact VISTA Clinic Australia Melbourne cosmetic clinic over mobile, email, website contact form, fax. Cosmetic doctor will review and treat you post procedure free of charge for you. Cosmetic patients safety is important for VISTA Clinic Australia Melbourne. You won’t be left, but taken care of. This caring attitude towards our cosmetic patients, protocols and available help is 1 of the features which our cosmetic patients appreciate. How long does the results of wrinkles removal last? Great news that the results of the Plasma skin tightening treatment are permanent and may be visible for years. But we should acknowledge that the aging process is continuous and thus the skin ages every day after the procedure and this cannot be stopped. 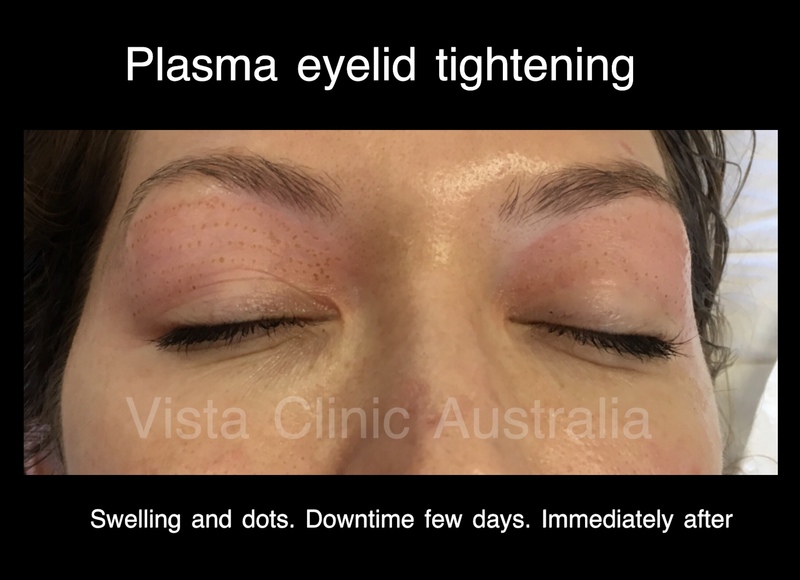 VISTA Clinic Australia Melbourne experience that skin tightening treatment is recommended to maintain every 2-3 years or as needed by our cosmetic patient. VISTA Clinic Australia Melbourne cosmetic physician will assess your individual situation and discuss best cosmetic treatments for your individual situation. 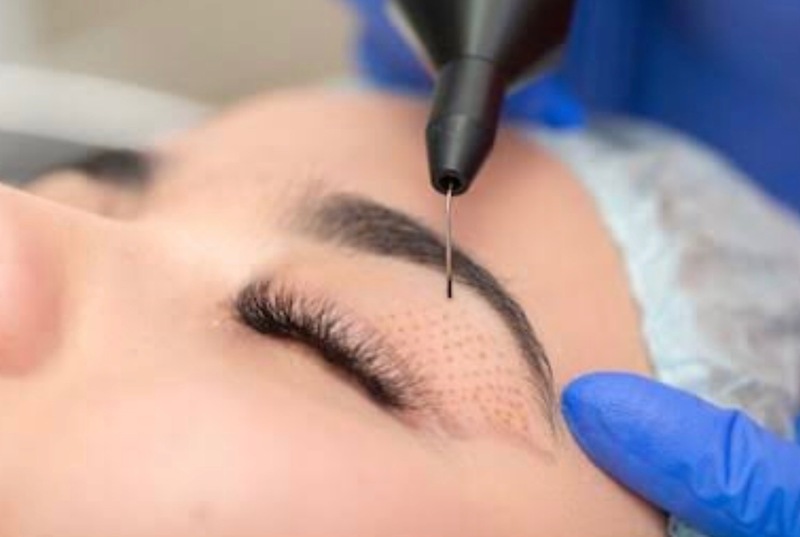 Normally only one treatment per area is needed to achieve great results of eyelid skin tightening. Melbourne cosmetic patients advised to plan wrinkle tightening with plasma treatment in less sunny months (from May till November) and use sunscreens religiously. 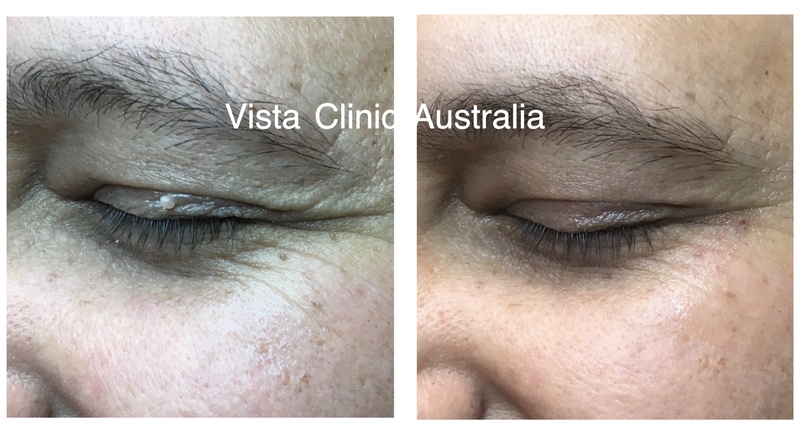 Such safety precautions at VISTA Clinic Australia Melbourne allow to minimise post-treatment hyperpigmentation and to achieve maximum wrinkles and skin tightening. Our Melbourne cosmetic physician may prescribe you individually tailored preparation and/or post care skin treatment. However, if the skin laxity is severe and the treated area is big, additional treatment can be done in 3 months.